Shell commissioned the construction of a mobile measurement station, named KISS, for the accurate measurement of gas for its reservoirs on the coast of Holland. The station enabled flexibility for the company to approach its wells, in line with the application requirements, using a portable metering skid. Now the station’s successor KISS Next, enabled by the SICK FLOWSIC600 ultrasonic gas flow meter, is adding new features for stable gas volume measurement. Shell pumps gas from 5 000 metres below the surface and from there it is either used internally or sold to customers. As such, it is crucial that gas flow is measured accurately even in the event of widely fluctuating pressures. Another consideration is the varied quality of untreated gas which, depending on the deposit, may contain water and condensate, sand and dirt and fluctuating temperatures (from -20 to 115 °C). When it comes to measuring gas, the bar has been set high, which creates challenges and imposes conditions – on the measuring device, on the technology, and on installation and maintenance. And the project is not just attractive for Shell, one of the largest oil and natural gas companies in the world, but is important to meet the Dutch government’s energy policy as well as gas producers worldwide. In the Netherlands, natural gas is a key source of energy and accounts for nearly half of the total energy mix. As we enter a new era in terms of energy, an intelligent approach to gas production is crucial. Even small gas fields can support the Dutch government’s energy policy. “Economical production is a fundamental requirement for this. This includes lowering costs, using new technologies, and taking advantage of infrastructure,” explains Ying Tang, Metering Engineer at Shell in conversation with Jörg Wenzel, Head of Product Marketing Services at SICK. Keep it simple and smart – is that what KISS from Shell refers to? Exactly, that’s KISS – a compact and mobile gas system, approximately 12 m long, 2 m wide, and 2 m high, that is ideal for small gas fields. SICK launched KISS in 2004. In doing so, the goal was achieved: to design an innovative type of technology for extracting natural gas in small fields – in a simple, standardised and automated manner, with reduced production, commissioning and project costs. If a well dries up, KISS is loaded onto the truck and transported to another well. The practical construction and installation also simplifies the entire process, from planning right through to delivery. Positioned on the well, KISS has plug-and-play functionality, meaning it can be quickly and directly connected to control centres. The gas flow is controlled and the pressure and temperature are monitored from there. The gas quantity must be recorded in a reliable and accurate manner, which means that the right technology plays a key role. When did Shell decide to use ultrasonic gas flow meters from SICK? At the point when KISS Next came about. When you’ve launched something new on the market, you want to keep perfecting it. Optimising the gas flow measurement was crucial as the gas flow meter is one of the main components in KISS Next. The differential pressure measurement used previously with Venturi was too restrictive when it came to the flow range. As a result, different designs were required and this often resulted in conversion work – while also having to cope with fluctuating flows. In the end, the installation conditions meant that the overall design of Venturi was too large and costly. We had to find a feasible solution that was fit for purpose. That is now the FLOWSIC600. Does the FLOWSIC600 fulfil the legal requirements for measuring devices and measuring conditions? In addition to the main characteristics it offers, the measuring device needs to cover a wide range of applications and significantly reduce the skid size. We spoke to a few manufacturers so that we could gauge the application requirements for the meter performance. We discussed minimum inlet zones, the measuring properties of untreated and wet gas, changing conditions in the process, noises in lines, and – most importantly – the very high level of measurement accuracy. That’s something we have to be able to depend on. We were really impressed with the ultrasonic gas flow meter from SICK. In addition, the ultrasonic technology from SICK demonstrated clear advantages over the previous Venturi flow measurement principle. Can you give examples of some of the advantages? The direct path layout of the FLOWSIC600 is much more rugged in wet and dirty gas mixtures. Reflection paths, for example, quickly fail because dirt influences the reflection. What’s more, the FLOWSIC600 has a much wider measuring range of 1:120, complies with the volume fraction of more than 1 percent (LVF < 1%) for wet gas measurement, and also has a longer service life. Just what we need – and we can ensure fault-free operation. What does ensuring fault-free operation mean to Shell? The technology that we use needs to be reliable. We expect gas flow meters to measure very accurately for the long term. Even the noise from the pressure regulator, which is installed directly opposite the gas flow meter and makes a lot of noise, does not have an effect on the FLOWSIC600. However, if the measurement is affected, we need to know the cause as soon as possible. Only then can we respond quickly and initiate countermeasures. With the MEPAFLOW CBM software solution from SICK, we get user-friendly data access to the FLOWSIC600 with lots of diagnostic options, such as the ability to check the signal-to-noise ratio or gain parameters. If these change, this could indicate contamination or an increase in CO2. Any impairment which arises is displayed before they have an impact on the measurement. This is ideal for us – when it comes down to it, we want to ensure high-extraction volumes without faults and delays so that we can affirm Shell’s excellent reputation as a reliable supplier. So everything is flowing smoothly – even when it comes to the legal requirements? Yes. The FLOWSIC600 has all the relevant certificates for explosion protection. On top of this, it has to fulfil the requirements of ISO 17089 for ultrasonic flow measurement. In these standards and at Shell, measuring tasks with different accuracy requirements are categorised in different classes. At Shell, there are three classes: Class 1 is provided for custody transfer gas measurement involving large quantities of gas and the uncertainty must be less than 1%. Class 2 is also for sales and taxation, but between facilities and entities with less than 2% uncertainty. Class 3 is typically used for the gas production area close to the well with a maximum measurement uncertainty of 10 percent. With the FLOWSIC600, we achieve class 2, despite the liquid content in the gas. As a result, we can use the skids in an even more versatile manner. Local authorities can also remove one path (path 4) to achieve Class 2 requirement, as the FLOWSIC600 is certified with its four MID measuring paths. How long has a mobile measurement station of this kind been in operation? And do you also sell KISS to other oil companies? KISS has been designed with a service life of 25 years. All skids are ready for delivery on demand from our warehouse – KISS, KISS Next or Chemical Injection skids. We have currently built five of the 12 planned KISS Next units. With KISS Next, the system design is even slimmer and more cost-efficient, and mobility has become even more convenient. The standardised high-level pre-production means that it can be constructed on site within one to two weeks. At the moment, we are only aware of a few relocations of complete skids. However, this will soon change when companies start processing their fields one after the other. With the FLOWSIC600 gas flow meters, it is even possible to serve a group of wells with the same skid. Shell and SICK have set precedents – can we expect success from them? The mobile gas system is already one of the most remarkable system developments. Without this innovative development, a lot of natural gas would probably remain unused underground. 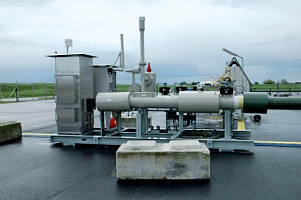 The KISS skid is small but refined – it regulates the gas flow in small natural gas fields, and controls and monitors the flow, pressure and temperature. The outstanding system technology goes hand-in-hand with low investment and operating costs – that’s remarkable in itself. With the rugged and compact FLOWSIC600 ultrasonic gas flow meter, we can cover an enormous flow range reliably, the system monitors itself constantly and provides intelligent device diagnostics, and we get a measurement with long-term stability. SICK is one of the world’s leading producers of sensors and sensor solutions for industrial applications. Founded in 1946 by Dr.-Ing. e. h. Erwin Sick, the company with headquarters in Waldkirch im Breisgau near Freiburg ranks among the technological market leaders. With more than 50 subsidiaries and equity investments as well as numerous agencies, SICK maintains a presence around the globe. In the fiscal year 2015, SICK had more than 7400 employees worldwide and achieved Group sales of just under EUR 1.3 billion. Additional information about SICK is available on the Internet at http://www.sickautomation.co.za or by phone on +27 11 472 3733.